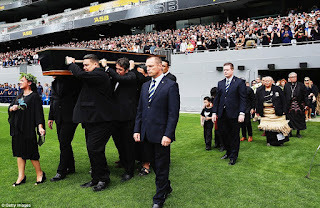 · It was the most fitting tribute to a rugby giant. In suits, in sports kit and in T-shirts emblazoned with his name, scores of mourners filed on to the pitch to perform a last haka for Jonah Lomu. 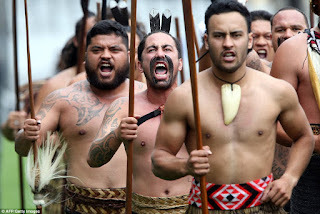 · The venue, Eden Park, is the home of New Zealand rugby and a stadium where the 6ft 5in All Black had played many times before a crowd awed by his power, speed and sheer stature. · But on Monday there was no match to win. 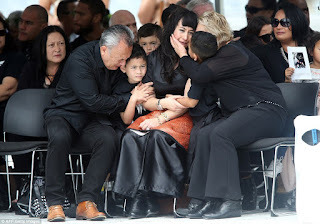 Instead the crowd of 8,000 people gathered solely to honour Lomu, who died unexpectedly at the age of 40 from a cardiac arrest a fortnight ago. 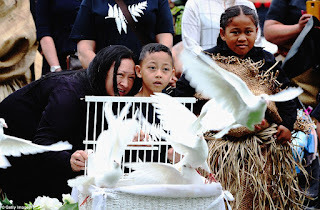 · Among them were his wife Nadine, 34, and their children Brayley, six, and Dhyreille, five, who released doves in his memory. 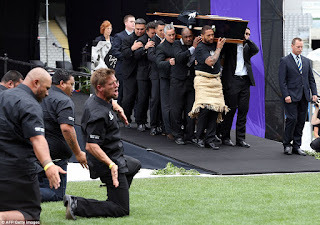 The haunting rendition of the haka was performed by former and current All Blacks as a hearse containing Lomu's body was driven onto the pitch. 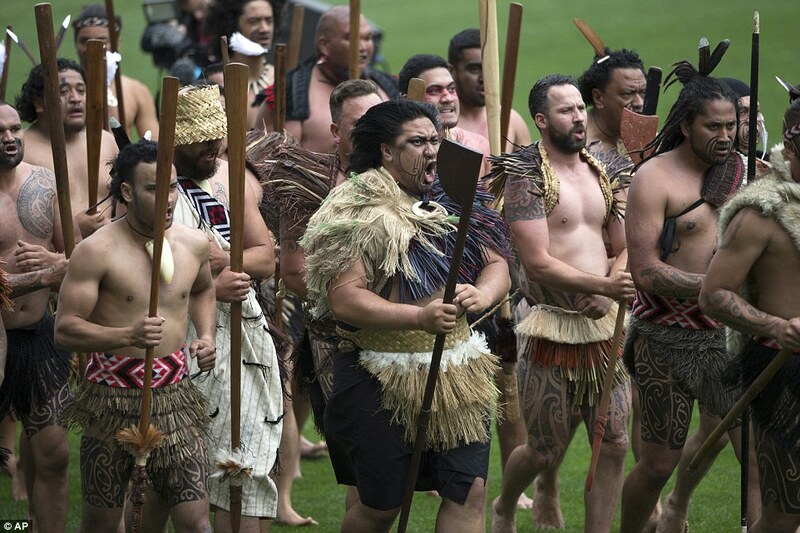 Former All Blacks team mate Eric Rushspoke from a stage, recounting tales of an aversion to training and a voracious appetite that brought Lomu into conflict with the strict nutritional edicts of his professional coaches. 'It was a love-hate relationship. I loved training, he loved the Manukau city food court,' Rush said, referring to his hometown. The service followed a special 'family day' which was held in Manukau, New Zealand to celebrate his Tongan heritage on Saturday. A private family funeral will take place on Tuesday. 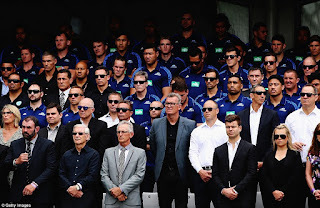 New Zealand Prime Minister John Key, who was unable to attend the service due to his commitments at the UN summit in Paris, sent a video message honouring the All Blacks great. 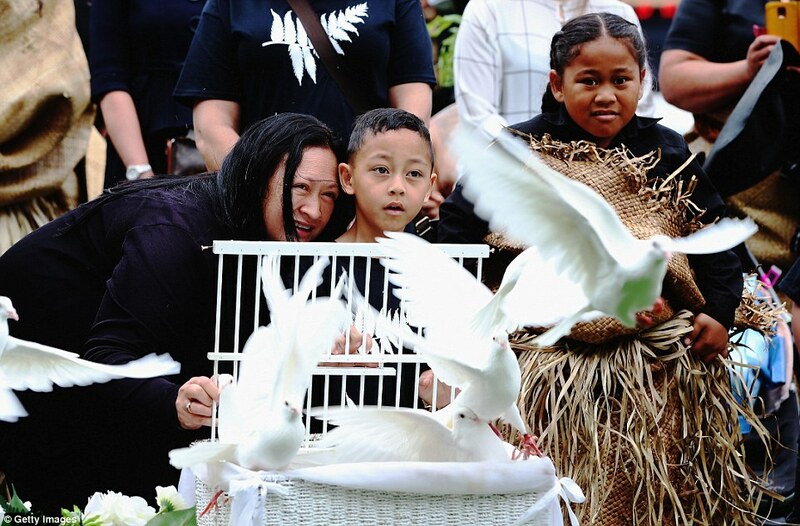 'He meant so much to his family and his community,' said Key. 'He wanted to make a real difference to people's lives and he certainly did that. 'He proved that you can come from anywhere in New Zealand, from any background, and make it to the top. 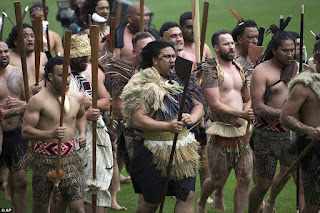 The giant winger was rugby's first global superstar following his remarkable performances during the 1995 World Cup with his four-try showing against England in the semi-final a seismic moment. Lomu, who scored 37 tries in 63 Tests for New Zealand, was diagnosed with the rare kidney disease, nephrotic syndrome, in 1995, which made his achievements on the rugby field all the more remarkable. 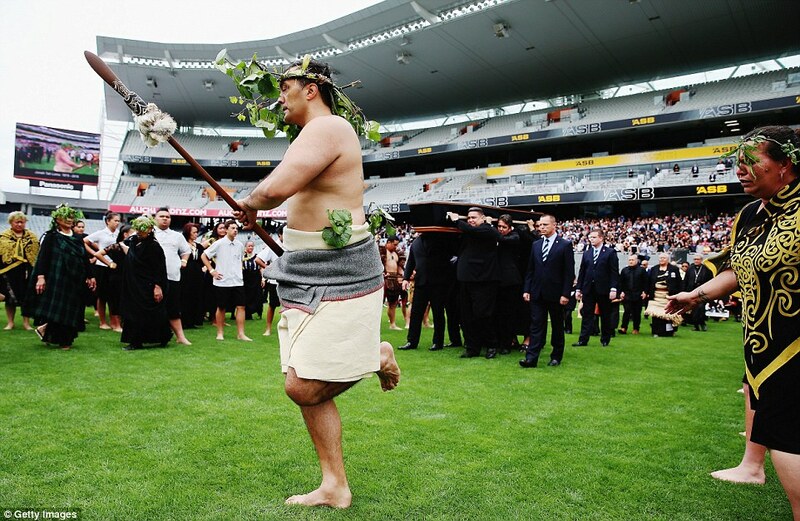 Despite the debilitating nature of his illness, Lomu went on to shine for the All Blacks at the 1999 World Cup. Lomu's illness eventually forced him to hang up his boots and he had a kidney transplant in 2004, but the organ stopped functioning in 2011 with the former Wellington Hurricanes winger forced to undergo regular dialysis. 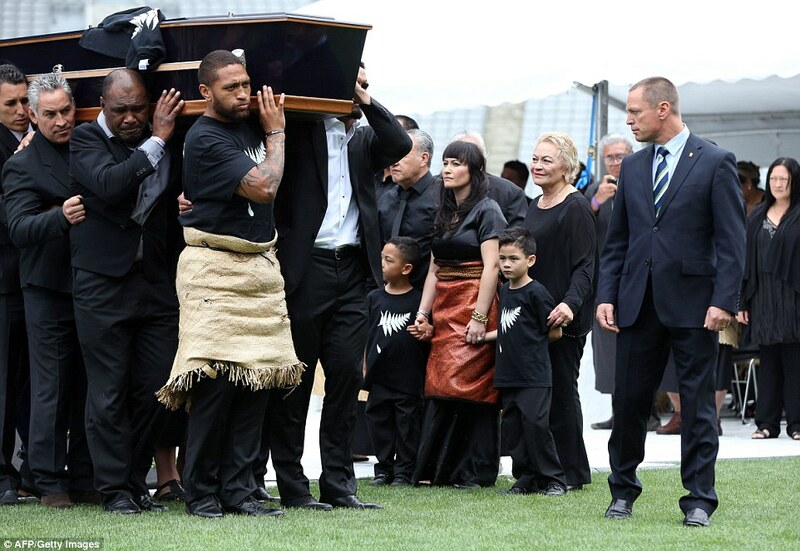 World Rugby chairman Bernard Lapasset travelled from France to pay tribute to a true giant of the game. 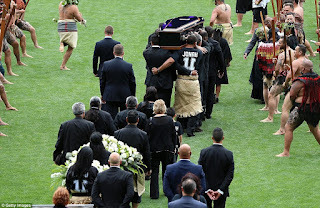 'Jonah Lomu was a giant. He was a towering presence in any team,' said Lapassat. 'As well as being a giant in the game, he was a giant of the game. A true rugby superstar. 'He will be greatly missed and fondly remembered. Jonah inspired millions around the world with his incredible strength and power. 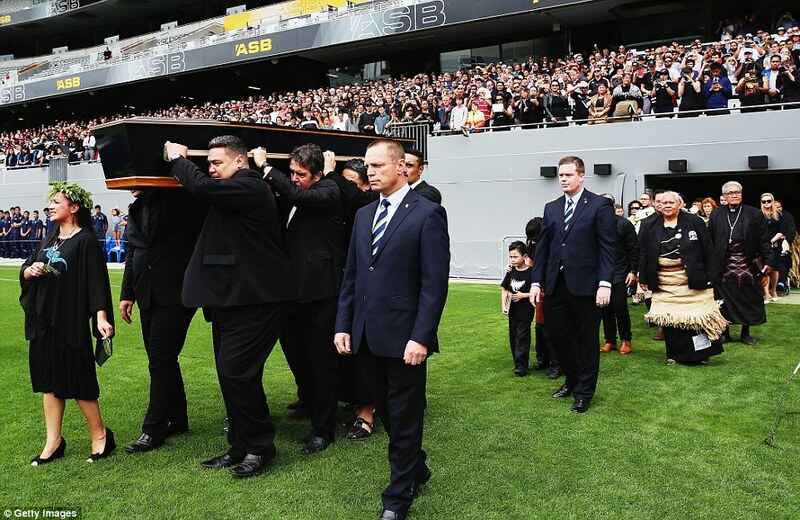 'His contribution to rugby cannot be overstated. He took our sport to a new level and profile. 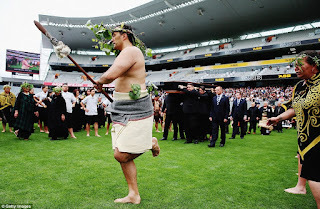 At the World Cup in 1995, he burst on to the scene scoring seven tries in five matches. 'When I think of that amazing tournament in South Africa 20 years ago, I think of two people. Off the field, I think of Nelson Mandela. 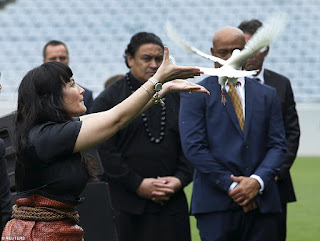 On the field, I think of Jonah Lomu. Both men inspired millions around the world. 'I know that one of the things that Jonah loved about rugby was its ability to get people together. 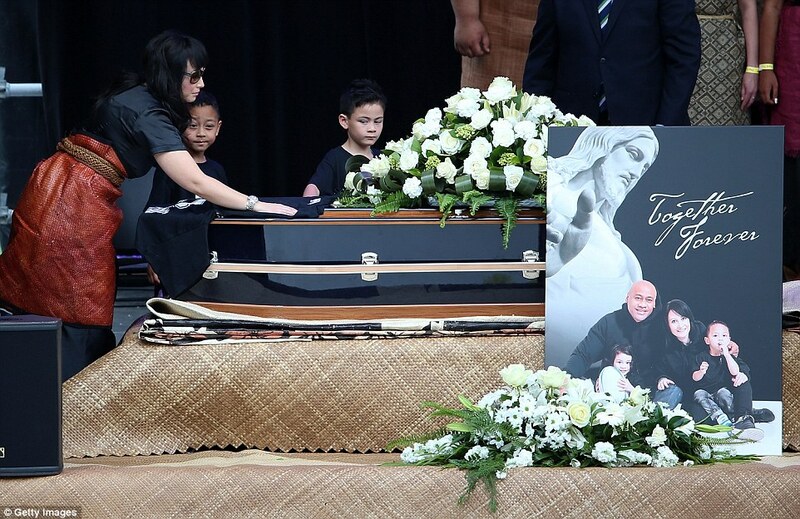 Speaking on behalf of Lomu's wife Nadine and the rest of his wider family, former All Blacks coach John Hart spoke of his admiration for a player who 'saved his best for World Cups'. 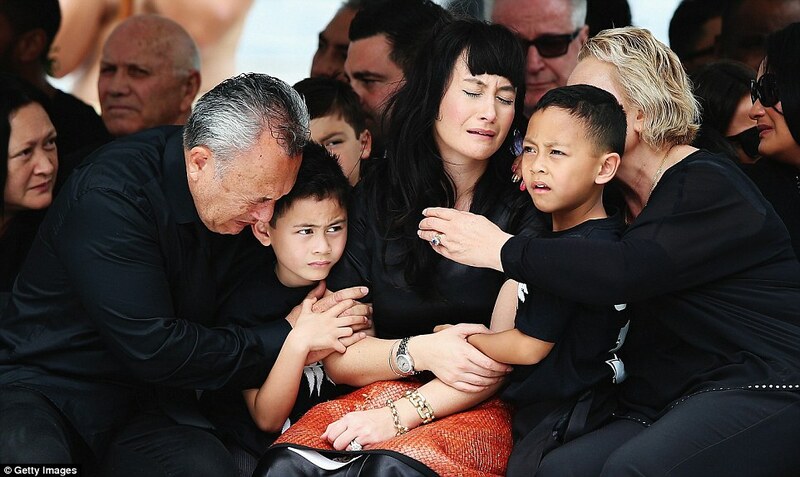 'Today it is my privilege to speak on behalf of Jonah's family,' said Hart. 'The family would like to thank the thousands of people, at home and abroad, for their kind messages. 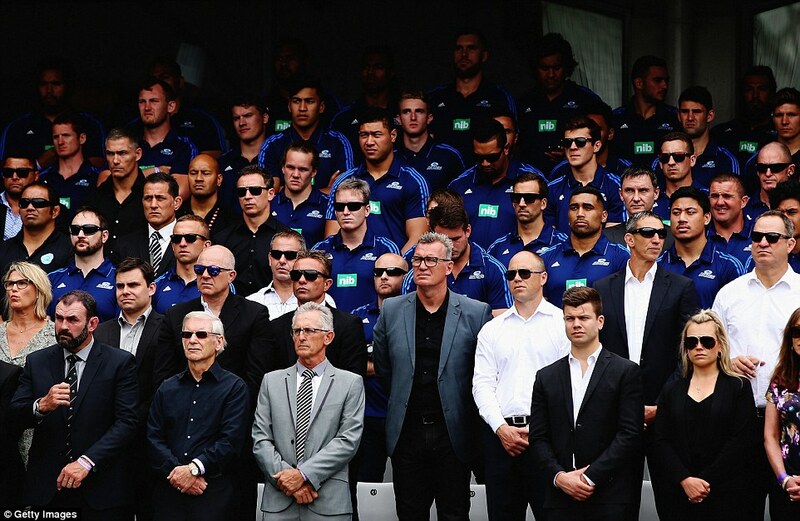 'Today, we celebrate the all too short life of a great New Zealander. His record number of 15 World Cup tries scored in just 11 matches was only matched recently by the great South Africa winger Bryan Habana. 'The most remarkable aspect of Jonah's career is that throughout, he was suffering from a serious kidney disease. 'It is frightening to think what he could have done on the field if he had not played the majority of his career with his hand on the medical handbrake. 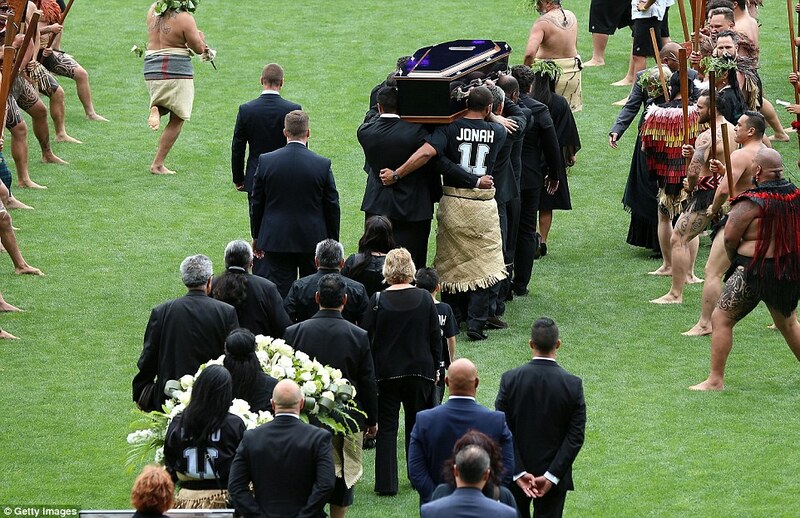 'Jonah did not want anyone to know, including his All Black coach at the time, nor his team-mates, as he never wanted to use it as an excuse. 'Jonah, you were many things to many people. You were a freak on the field and a gentle giant off it. But most of all... you were a lovely, lovely man.